So quick and easy, these Healthy Banana Oatmeal Blender Muffins are a perfect for make ahead breakfast for you or the kids. Naturally gluten-free, dairy-free, and refined sugar free, too – perfect for the 21 Day Fix or Weight Watchers! This post contains affiliate links to products I’m obsessed with. I’ve been wanting to make a blender muffin for quite some time now. While there are TONS on Pinterest, so many of them call for Greek yogurt, and because my son is dairy free, we could never make them. And while I love to cook, I definitely wouldn’t call myself a baker. But I have a couple very popular recipes on my blog for breads and muffins…Banana Bread and Baked Oatmeal Cups, I’m looking at YOU! And, so I kind of merged those two recipes together and added a blender component to make this new one. 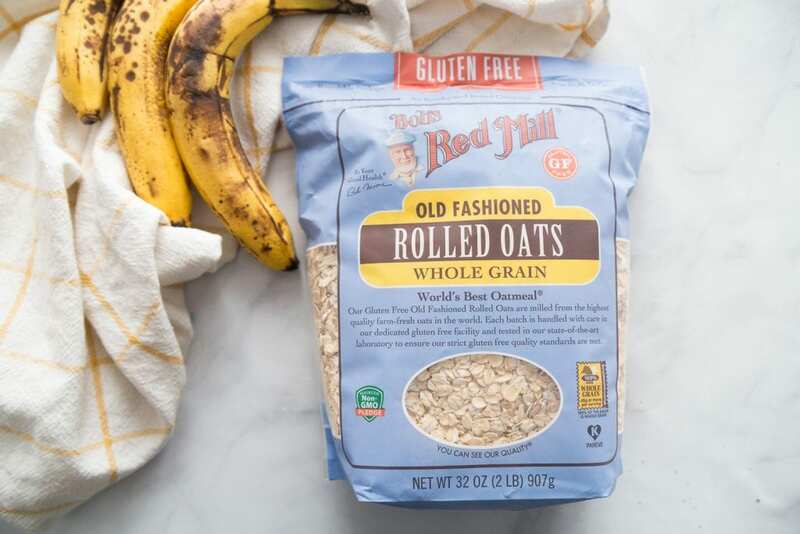 I grabbed a bag of my FAV Bob’s Red Mill Gluten Free Old Fashioned Rolled Oats and some ripe bananas and got to work. It’s really easy to use your blender to make muffins! 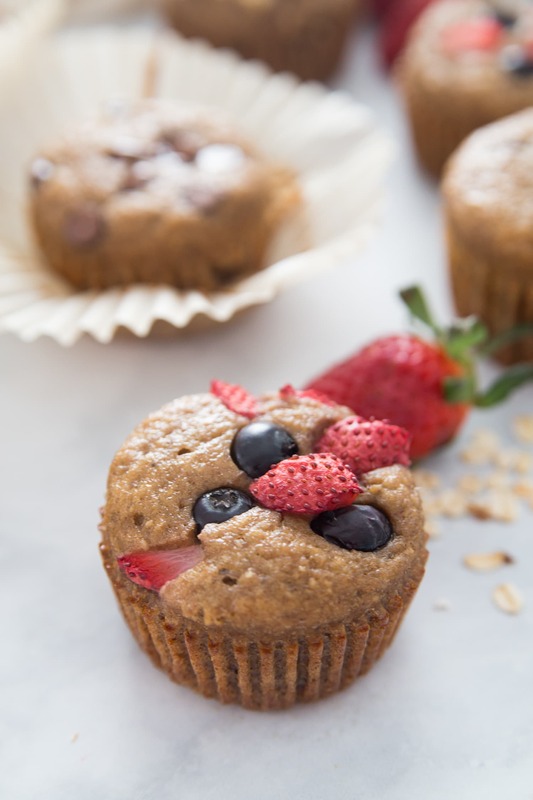 Unlike my Baked Oatmeal Cups, I decided to blend the oats in this recipe to give the muffins more of a, well, muffin-y texture. 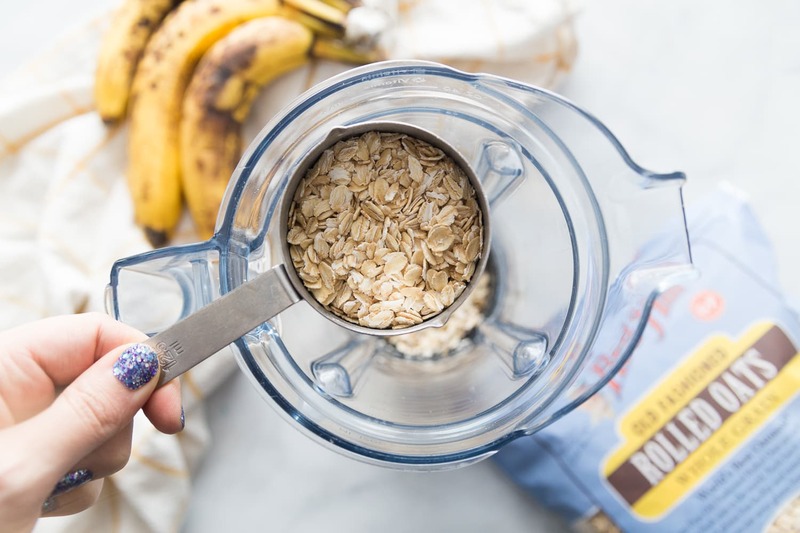 This is perfect for people who want to enjoy the health benefits of Oatmeal, but don’t love the taste or texture of it. 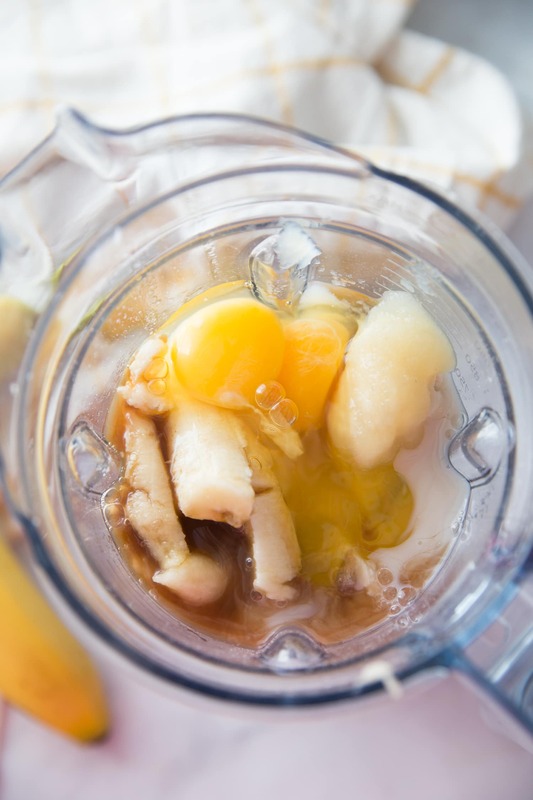 And I love how easy it is to blend them up right in my Ninja – you are basically making an oat flour without needing to use your food processor. Then you add the remaining ingredients and pulse. So freaking simple! 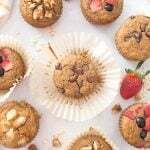 What kind of toppings or Mix-ins can I use for these Healthy Blender Muffins? I decided to borrow a page from my Baked Oatmeal cups and make these with different fun toppings! These have a very similar taste to my banana bread, so clearly dark chocolate chips are a perfect choice. But I actually really enjoyed the fruit and nut combinations, too! You can also mix fruit or chocolate chips right into the batter if you want. 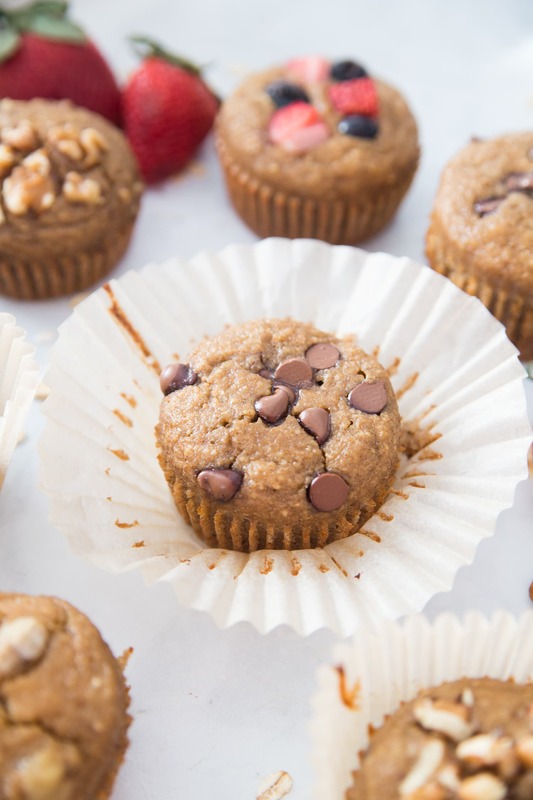 Are these Healthy Banana Oatmeal Blender Muffins good for the 21 Day Fix or Weight Watchers? Of course! You can have TWO of these blender muffins as a serving for breakfast. 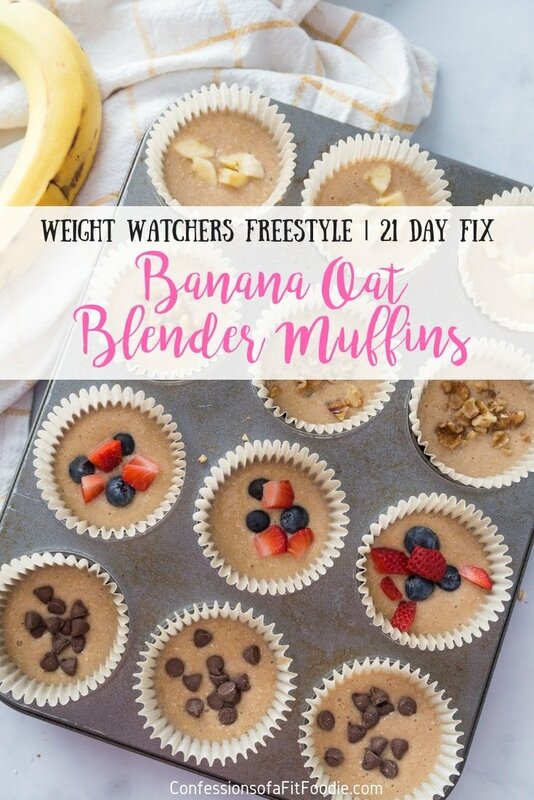 They are only 5 Weight Watchers Freestyle points per serving, and for the 21 Day Fix, you will use 1 yellow, 1 purple, and 2 sweetener teaspoons for BOTH muffins! Are these 21 Day Fix Blender Muffins good for meal prep? Totally. I love prepping anything that is quick and easy, but saves me tons of time in the morning. 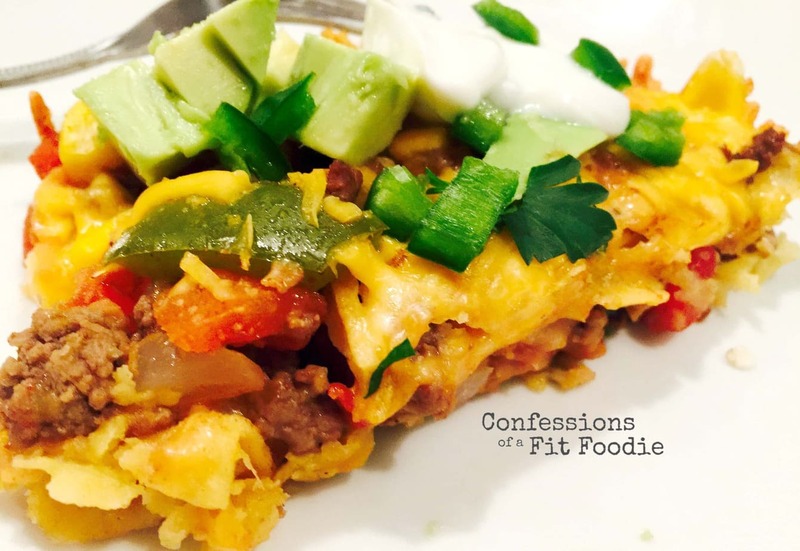 If I make a batch of these on a Sunday, I know I have a quick grab and go breakfast or snack for both me and the kids! How should I store these Banana Blender Muffins? 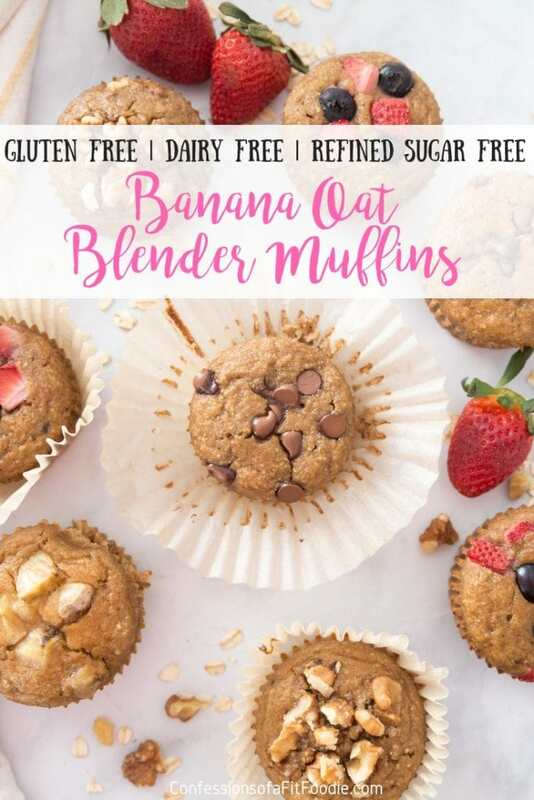 Are these Healthy Banana Oatmeal Blender Muffins freezer friendly? You should keep these muffins in your refrigerator and eating within 3-5 days. If you want to keep them longer, they freeze very well! 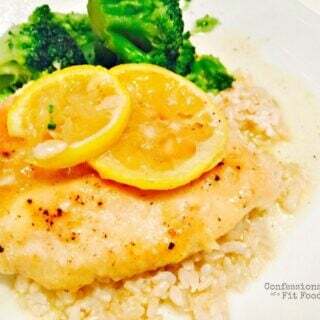 I like to thaw overnight in the fridge and warm in the microwave for a few seconds before eating. 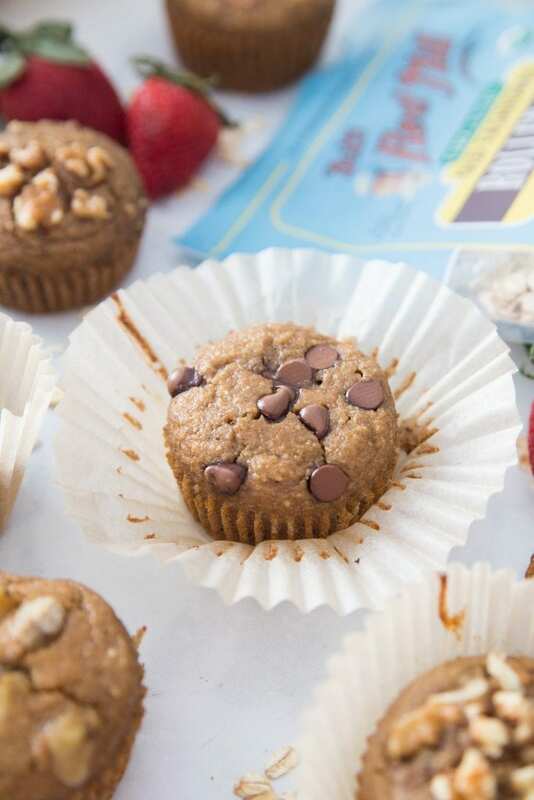 So quick and easy, these Healthy Banana Oatmeal Blender Muffins are a perfect for make ahead breakfast for you or the kids. Naturally gluten-free, dairy-free, and refined sugar free, too – perfect for the 21 Day Fix or Weight Watchers! Place GF Old Fashioned Oats in your blender and blend on high until a flour forms. 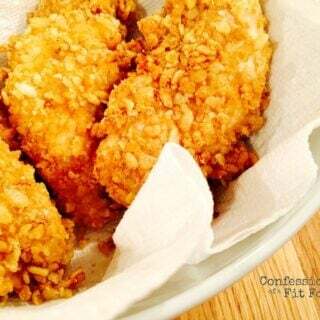 Place oats in a small bowl and mix in salt, baking soda, and cinnamon. Set bowl aside. Pour oats back into blender and pulse a few times just until combined, using a rubber spatula to scrape sides as needed. Line a cupcake tray with liners – I LOVE using parchment liners – and spray with coconut oil cooking spray. 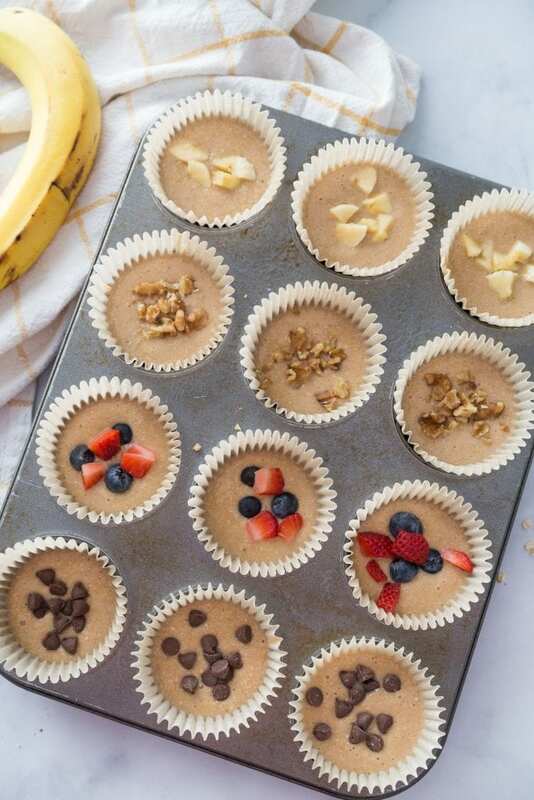 Pour batter evenly into cupcake liners – about ¾ full. 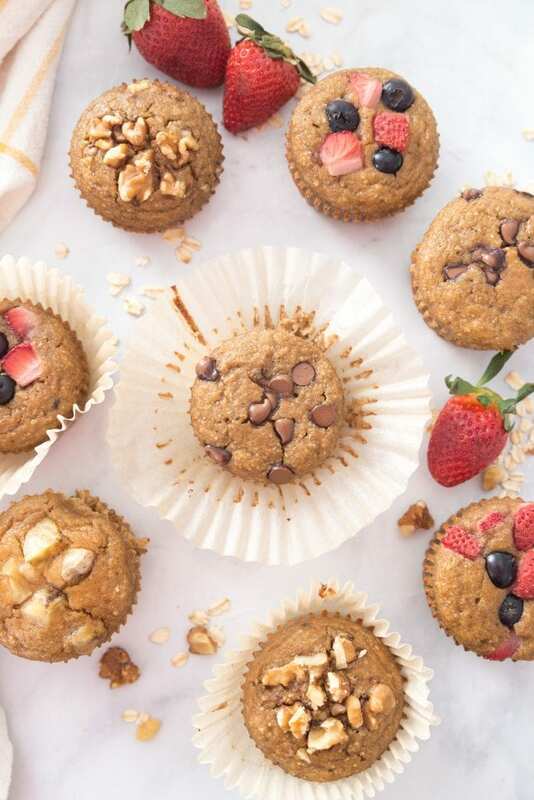 Top each muffin with 1 Tablespoon of the fruit toppings or ½ Tablespoon of the chocolate chips. Bake for 20-24 minutes or until toothpick comes out clean. 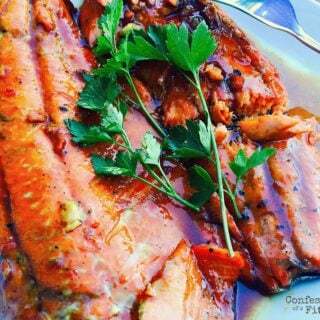 Store in the refrigerator or freezer after cooling.